Rajasthan High Court District Judge Recruitment 2019: Good news for the candidates who are searching Government Jobs in Rajasthan State. The Rajasthan high court will soon release the notification for various vacancies of District judge posts. This vacancy will be filled up Posts of District Judge through the High Court of Rajasthan Recruitment 2019. Eligible Advocates can apply for the recruitment to the vacant posts in the District Judge Cadre of Rajasthan Judicial Service. 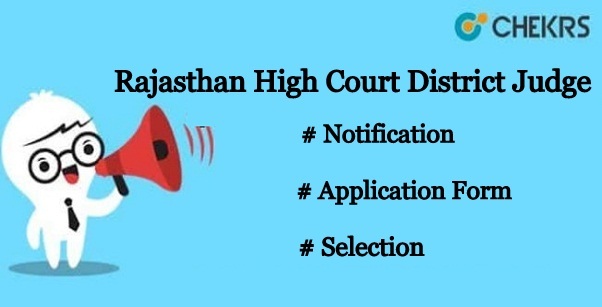 Latest Update: The Rajasthan HC will soon publish the District Judge Recruitment 2019. Interested & Eligible applicants now apply before the last date. Recruitment Process completed on or before the last date of District judge. The Candidates who want to make their career in the High court of Jodhpur must be aware of Rajasthan High Court Recruitment 2019 Notification. Here, we are providing all the information regarding recruitment like the number of posts, the name of posts, released dates and last date of the application under section. High Court was established on 21 June 1949 by the constitution of India. There were five high courts functioning in the various units of the state. These are unit Jaipur, Jodhpur, Bikaner, Udaipur, Kota etc. High Court of Rajasthan is providing the opportunity for District Judge Posts and here has the scope of a career in the High Court for future. The Candidate must have a degree of Bachelor of laws and an Advocate can apply for vacancies on the Rajasthan High Court District Judge 2019 Application Form of the high court of Rajasthan. The High Court of Rajasthan fills up District Judge Posts of Five units of the High Court. In the application form process, the Candidate must have knowledge of eligibility criteria and source of the application form. Here, we are providing information regarding recruitment application form below section. The Candidate must hold a degree of Bachelor of Laws (Professional) of any University or Institute established by Law in India. Aspirants must have been an Advocate for a period of not less than seven years on the last date fixed for submission of online application. All the candidate must possess a thorough knowledge of Hindi Written in Devnagri Script and Rajasthani Dialects and Social Customs of Rajasthan. The candidate’s minimum age should be 35 years and maximum age should be 45 years as on 1st January 2019. The candidate who has reserve categories gets relaxation such as 5 years for SC/ST caste, OBC, Woman candidate. Selection will be based on the merit list of Written Examination of District Judge Recruitment 2107 and Interview. Search on the middle side “Recruitment District Judge cadre, 2019” and click this link. After clicking the new window will be open. Candidate read all advertisements of notification, Instruction for filling an online application, Annexure to be attached with the printout. The application form is attached from this link. Fill all the details carefully and submit it online. For more information, we can update soon about Rajasthan High Court District Judge Recruitment 2019 and we are providing the latest update related to upcoming Recruitment on our website that is www.jobs.chekrs.com. If you have any query about the High Court of Jodhpur Recruitment that writes on the comment box and takes review or feedback.